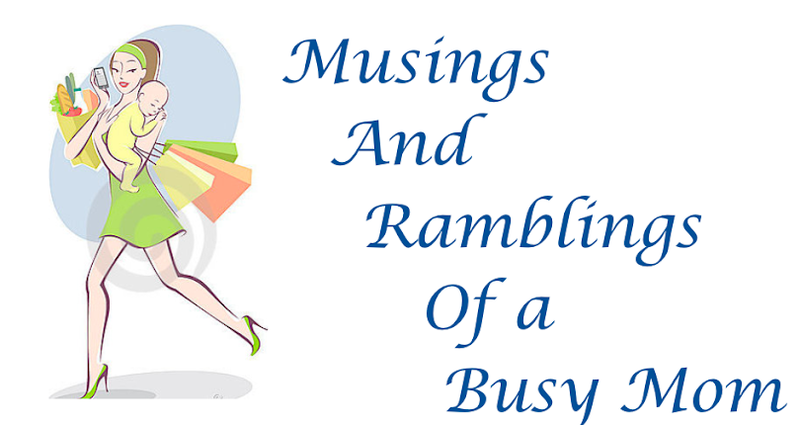 When I was going to switch from my role as a working out of the home mom, to a stay at home mom my husband and I sat down and had a discussion of what my "job description" would be. We both agreed that as a SAHM I would still have certain responsibilities and "duties" that I need to do to keep the home running at a level that both my husband and I agreed is what we would except from someone who did not work outside of the home. We sat down and hashed out what we each felt were important roles for me and him to be completing in the home (because he still does some house work) and the overall level of performance we both think is acceptable. Basically he wanted to make sure that I wasn't just laying around the house (yeah right) and I wanted to make sure that his expectations were not too unreasonable, because while I may be at home I am taking care of a young child and will soon have a new born and THEY are the primary reason fro me to be home. Additionally, I wanted to make sure that he understood that just because I was at home didn't mean that he was automatically free of all household chores (um, NO). Once we figured out and agreed on what we each expected of one another I set out to make my life as easy and efficient as humanly possible. So being the modern woman that I am, I headed straight for pinterest! I researched organization ideas and efficient ways of cleaning, just to see if there was anything I could use. I found a lot of great ideas, and one of my favorite was the idea of a cleaning schedule. It was so awesome to me the idea of breaking your household chores down into simple components and then scheduling them throughout the week/month so that you aren't just deep cleaning your house once a week for an entire day. There were a lot of different types that I found, but I decided that what would work best for me would be to break my tasks down into daily, weekly, and monthly levels. I chose some items that I need to do every day-like loading the dishwasher, or decluttering the living room. 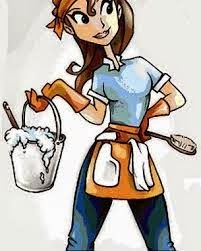 Then I decided on the tasks that could be done once a week and still leave the house looking nice, these are larger tasks that take a little longer to get dirty again-like cleaning the showers and toilets. Finally I decided on tasks that are more "deep cleaning" tasks that really only need to be done once a month. My monthly tasks I dedicated to be done on Fridays, and I labeled Friday as my "swing" day, where I do one or two tasks each Friday so I am never too overwhelmed with cleaning. This way I am able to clean my house a little at a time, this allows for me to have plenty of time to to fun things with Isabella and my house always looks clean because nothing really every gets truly dirty! I have been doing this routine for about two months now and it has made my life SO much easier! I find I spend maybe an hour a day cleaning total and I have the rest of the time to run errands and most importantly play with my little girl! And when my hubby comes home the house always looks like I've been working all day on it, and he doesn't need to know I found a loophole in the system! 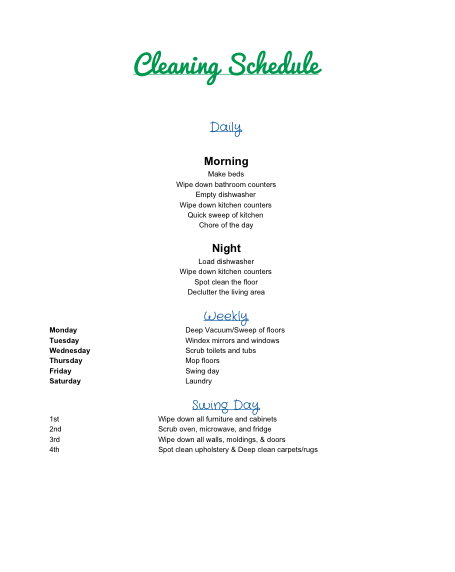 If you would like to see how I made my cleaning schedule I have attached the google document at the bottom of this post, feel free to use it! Also, if you're interested in the recipe I use for my all natural DIY multipurpose cleaner check it out here. I use it to clean my stainless steal appliances, my tables, bathroom countertops, tubs, showers, kitchen counters, AND my laminate wood floors! Simply amazing!